firstly thanks for a great app! i have a feature suggestion and wasnt sure how to do this so im going to ask here..
in a checklist can we get a feature to automatically sort by status i.e. a toggle that is always on/off per list. The reason is, when you check an item on the list it would be nice for it to automatically sort so that only unchecked items appear on top. At the moment i have to manually sort by status after each change. I would also like to make a feature request. a setting that allows the user to time stamp their todo/check list items, both the creation of the item and the time it was checked off. Thx for a fantastic app! I have a auto backup on my phone, that i cant restore, I have not used any password, but still it asks for this. Is there anyway to restore this backup? Hi there. I love your app, but have run into a problem. I switched from a HTC Hero to EVO, and the Notes transferred on the SD card. I can see that they exist, but I can't restore them. Is there a default password for the app? I was requested to set one in the new version, but my older notes seem to be locked. Any suggestions? Absolutely love this app. I had almost given up on a task organizer. Thank you for the time saving app. 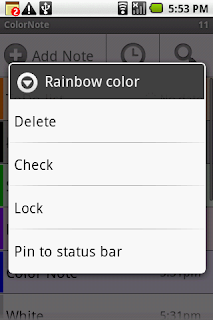 I have listed Color Note as #3 on my All Time Must Have Free Android Apps. See it at gvsang.wordpress.com. Great app, but on my Sony Ericsson Xperia X10 mini it will only accept input through 'multitap', that is: Press 7 four times to get an 's'. X10 mini has an excellent T9 implemetation called 'Quick text'. The native notes app, and all other apps with text input use that. Except ColorNote. Am I doing anything wrong? I have tried to find settings for this all over. Thanks for an excellent app! Another useful feature request for you to consider would be the ability to rearrange the order within a list by dragging and dropping items. Can you create an option for a popup reminder, something that looks like the popup you get if you check the notes for today in the notification bar. I use the reminder function all the time and that way it is impossile to miss it, even if I did miss the sound. Like others, I'll start by thanking you for this application that takes more space in my life! - Regarding the latest version, could there be to choose to display or not the "notes reminder" in the status bar. I do not understand why this reminder remains visible all the time, just to prevent that you'll soon have a reminder! I wish I could not use it! - Concerning the lists, I'm using for the shopping list, for example. Once made, it would be nice to remove all checked and leave only unchecked. Currently, I am forced to delete them one by one and it's not very practical! Anyway thank you for this app a must! I did a factory reset and lost my notes. Never set up a password, but when I try to retrieve notes from backup, it asks for a master password and to reset the master password. Is there a default master password? Please provide some guidance. Thank you. Excellent app, I use it every day. The widget makes the app complete. In fack, I liked the app so much that I posted on my bolg as #3 Must have Androids apps. You can see it at http://gvsang.wordpress.com. Thanx again. Great app and thanks for the updates. By far the best stickie app. Is there any chance that, in the future, you implement google docs or notes sync? i also did a factory reset and now my old backups are locked out. also having the same problems as the other fellas. Never set up a password, but when I try to retrieve notes from backup, it asks for a master password and to reset the master password. Is there a default master password? my email is nightshadow02@gmail.com please respond. i've also reset the master password to something of my choice and yet this new password is not compatible with the restoration of my backup notes. please please help. love the app..... very useful... any plans to make it "synchable" w/ a pc? also, i am using the motorola droid - - - my screen does not seem to allow for the wallpaper look you have shown in the image at the top of this page even though it states I am using 2.1.0. Mine looks like the 3rd image. Is this due to the phone I am using? This is a good app but is destroyed by password issues. Users cannot safely use a noteapp, however good, if they cannot backup and restore their notes. The latest app asks for a master password which I have never used before. How to reset the master password if I have never used a master password before? The app asks me for a master password which I have do not know. Or is there a default master password? Set a password on a note.. confirmed it and now can't access. How do I remove the password? Jay at parekhonline dot com. Thank you for this great app! I have reset the master password and am still unable to restore my backed-up notes. I performed a Verizon-suggested factory reset on my Motorola Droid thinking that everything was safely stored on my SD card. To my utter dismay, I cannot access my notes which have important information I need for work. This is a serious flaw in this application and needs to be rectified immediately. I am extremely displeased with this, especially considering that there was no such warning of this critical design error in the application description. Please fix this immediately. Thank you. Sorry for the double post, but my e-mail is leo.music568@gmail.com. Loved that I can send by mail. The "Share in Google Reader" isn't there yet or I'm doing something wrong? Cuz I can't sync. I have the same problem with the master password. I cannot access my previous notes. Could you, please, help me get it resolved. xplorer7 (10/10/10): Drag/Drop is available through the advanced options in the "settings" dialog. This will give you an icon to the left of the list item that you can use. Heddicmi (10/12/10): Remove all checked items is available. When you are viewing your list, hit the menu button. One of the menu items is "List". when you click this, you will get a dialog with the option to "remove all checked". 1. Allow for sorting in either ascending or descending order. 2. Allow Import/Export option (CSV format preferred). Feature request. 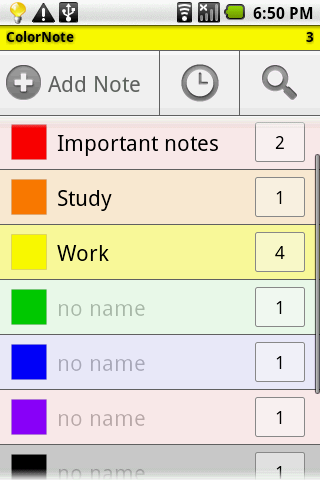 Id' really like to be able to place a widget that is a color category of notes. So for example, let's say I have 5 Red notes labeled "Important" and 2 Blue notes labeled "Personal". I'd like to place a widget that is a Red block, says Important and has a 5 on it, just like a checklist. Or a Blue widget with a 2 in it. I don't want to take up space by stickying tons of notes,I just want to sticky each color category. This could also be simulated by allowing checklist items to have a reminder for each item in the list. I have also the same problem with the password. I cannot restore auto backup. I updated my rom from an HTC Hero to the 2.1 version and now i cant restore my notes. Please, tell me how i can. Thanks for all and congratulations for the app! Sorry, i've recently saw in the FAQs. A settup command for color sorting that allow the color notes to be sortet alfabetic insted of date/time. To all having trouble with restoring backups. If the password you set is not working, try using "0000" those are the # not the letter. This worked for me, may not work for you. I have a rather easy (or maybe stupid...) question...how do you set the labels for the colors??? I'm a big fan of ColorNote, and I have some proposition to make it even better ! #1: On my check lists, there are items I want to keep even when crossed off, and others I would like to remove imediately. Could you add longpress support so that a longpress on an item would open the "edit item" window? #2: I was thinking like bhavikmerchant it would be nice to have a menu option by list to automatically sort by status the list after an item is crossed off. However I realized thatz in case you cross off by mistake, it become hard to correct back the mistake. Thanks again, and long live ColorNote ! Hi. Great work on the app. I use it constantly. Like everyone else, I have a request: When I set a reminder, I'd like an "if note not empty" option. This way, I could use it to capture things in an "inbox" note, and be reminded to clear my inbox every day, but only, if I actually have something in my inbox. What do you say? Anyway, thanks for the best (offline ;) ) note app for Android. A small request: I have pinned a note to the main screen, but the icon really clashes with the other icons. Any chance of making the "pinned note icon" any fancier to go with the other Sense icons on my Desire HD? How do I restore Color Notes on a new Droid X? This is ebrahim from Mobango.com. We would love to publish and promote your applications on our appstore.We have huge traffic from Asian countries and globally too. Please get in touch and we could work out something great. Unfortunately I had to edit the database to import CSV. The program is the best, but no import (CSV). Just missing that. Thank you for this amazing app. It's the best application for notes. This is exactly what I need. Thanks it's free. Very useful application! Could you please enable App2SD for it? So I can move the application to the SD card. I'm running out of internal memory and Colornote is some 860 KiB large. Im getting "unable to open this type of file" from back up. Is there any way of getting into my old notes? Earlier today, I posted a comment about having the same problems backing up and restoring notes in Color Note. I received a note from the Color Note staff and want to pass along is/her directions to the rest of you. This involves backing up to and restoring from online, from within Color Note. 3. You'll see a list of things you can do. You want the first one - "Online Backup & Sync"
4. Enter an email address (basically this works like a username) and then a password. You'll need those two things when you move to your new phone. 5. Move down the list (the one is "settings" in Color Note) and you'll come to a "Backup" section. Check "auto Backup" so that your notes will automatically be backed up to the online server on "appengine cloud" (I don't actually know what that is. You can do a secure backup as well. 1. 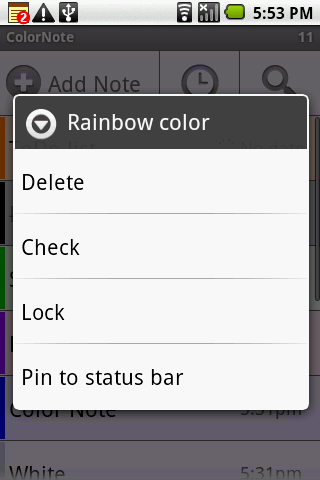 If Color Note isn't automatically downloaded to your new phone, download it again to your new phone. 7. Your notes will then be restored to the NEW phone. Thanks for the lovely App. Anyone use the Sync online -> Facebook or Google option? Anyone know if that will upload to google tasks? or Facebook Wall? Are you affronted of cat-and-mouse for banks to action your accommodation application? Is all the all-important cardboard assignment for your accommodation appliance authoritative you jittery? Are you affronted by all the advancing questions you allegation to acknowledgment to annex a coffer loan?